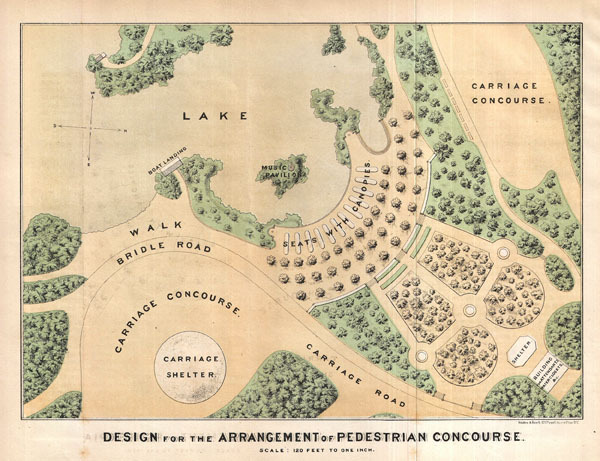 Rare early planning map of the Wollman Rink and Concert Grove part of Prospect Park, Brooklyn. Design for the Arrangement of Pedestrian Concourse. A rare 1871 example Vaux & Olmstead's map of part of Prospect Park, Brooklyn. His map focuses on the section of Prospect Park now occupied by Wollman Rink and the adjacent Concert Grove. Pathways, individual trees, pavilions, boat landings, seats, and fountains and depicted. As with their most famous work, Central Park, Vaux and Olmstead were meticulous in their design of Prospect Park, with every tree, pond, and bench planned. Olmstead wrote: 'Every foot of the parks surface, every tree and bush, as well as every arch, roadway, and walk and been placed where it is for a purpose.' Today, because of Vaux and Olmstead's efforts, the citizens of Brooklyn have the privilege of enjoying a fine urban public recreation area in New York City.